What is Social Media Content Labeling? As marketers, we naturally question most things, especially when it comes to the performance of our content and strategies. We all want to be able to answer those questions quickly and accurately so we can do more of the good and less of the bad. With social, this can be a uniquely challenging problem, as there are so many different factors that go into the success of each campaign. Finding the key element can be the difference between predictable engagement and floundering content. Enter content labeling. With most tools (especially native tools from social networks), you are limited to searching your content by time frame, making it difficult to identify what specificallymade your campaign successful. Content labeling allows you to group individual posts with custom labels so that you can analyze by segment rather than just time-frame. At the most basic level, you can quickly analyze posts related to a specific campaign. Our team, for example, tags posts related to #simplychat and #sproutchat, to quickly understand the impact and brand awareness those efforts are driving. Labels can be compared to each other for easy A/B testing. This functionality extends beyond just owned posts. You can label a competitor’s content to get an apples-to-apples look at how their product content performs against your product content, or just examine how their different strategies perform. 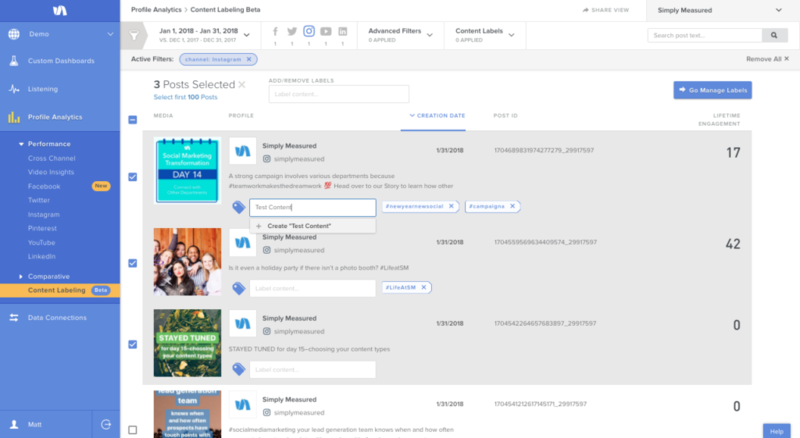 Influencer content is also easy to manage with labelling, which allows you to segment relevant posts from all other content the influencer produces. This can then be combined with your labeled content to produce influencer campaign wrap-up reports or compare influencer performance. Content labeling can be your secret weapon for determining what your audience cares about most. This leads to sustained, predictable campaign success. Best of all, you can answer the nitty-gritty questions from leadership or clients that previously required hours in Excel.